When you least expected it, it’s time to dive into the B.E.F. bucket again! Back when Martyn Ware was separated from The Human League, his crafty manager, who engineered the split [twice the fees] fed his ego in the maneuvering by saying that he should cut a deal with Virgin as a production company instead of an artist [even more fees for Bob Last!] and Ware took the bait. The upshot of this contract was that Ware could deliver as many as six albums under his B.E.F. production umbrella per year to Virgin. Having been freed from the crashing and burning politics of The Human League, he and Ian Marsh hit the ground, laying rubber. When did they find time to sleep? In 1981-2, there was the “Music For Stowaways” tape, “Penthouse + Pavement” by Heaven 17, “Music of Quality + Distinction Vol. 1” and this curio, ostensibly by the TV dance troupe Arlene Phillips Hot Gossip. For those not familiar, it’s as if DEVO had produced an album for The Solid Gold Dancers! [note: this almost, sort of, did happen – see “Word Of Mouth” by Toni Basil!] Ware, no chump himself on the royalty front, top loaded the disc with material he had a hand in writing; old Human League songs from the pre-“Travelogue” era. The only holdouts were a pair of songs from Sting and Talking Heads that the group had already recorded in pre-production. Even the odd single by The Men was revisited. The old Human League material benefits the most from the re-recording here if one is looking for new kinds of kicks in these interpretations. Three songs from “Reproduction” get a new coat of paint right up front. “Circus Of Death” get’s a new whipcrack beat and environmental sound effects added into the mix. The vocals are handled by the dancers gamely, but the material is so weirdly contrived, the cognitive dissonance the whole thing generates is considerable. The lyrics are so deeply enmeshed with the strange mind of Phil Oakey, the notion of a cover version seems ridiculous. “Morale” appears here shorn of its partner, “You’ve Lost That Loving Feeling.” The arrangement differs the least of all of these songs. It just has a new vocalist, Kim Leeson. Other than that, it’s pretty much the same track you know and love. “Word Before Last” is transformed by the addition of Synclavier and Linn Drum to the trusty Roland System 100 and Jupiter 4 that Ware and Marsh used on the original cut. Once again, the sound of anyone but Phil Oakey singing this deeply weird music is jarring. The title track was ripped screaming from the then current Heaven 17 album and the Wendy Carlos styled intro is intact, but for this track only, live drummer to the stars, Simon Phillips is added to the mix. Vocalist Richard Lloyd King does better at standing in for Glenn Gregory, but the killer revision here is the revisit of the odd one-off single by The Men [Human League operating incognito out of embarrassment]. I always liked “I Don’t Depend On You” and here it gets a big makeover that only serves to make it sparkle more brightly. The vocalists are much better suited for this song since it’s reasonably conventional in terms of its lyrics. Roy Gale actually sounds pretty good here! He’s definitely an improvement over Phil Oakey on the original. The addition of Linn Drum makes the syncopation pretty funky but the funk-o-meter seriously pegs with the addition of bass and guitar from Heaven 17’s secret weapon, John Wilson. He adds tremendously to this cut and it manages to outshine the already great original version handily. “Houses In Motion” also works well since Richard Lloyd-King stays within the parameters set by David Byrne. Geoff Westley produced this track instead of B.E.F. because it was recorded before Ware became attached to the project. It’s out of sorts to the rest of the album in sound, but it’s all so weirdly eclectic, it doesn’t matter much. The brief version actually ends before you expect it to. A cover of Sting’s “Burn For You,” from the “Brimstone + Treacle” soundtrack goes on for what seems forever! It actually manages to become even more pretentious here. Finally, Heaven 17’s “Soul Warfare” ends the album in a version not very dissimilar from the Heaven 17 version, save for the vocals. This album is an odd curio that I can recommend to Human League/B.E.F. fans with an open mind. I know I saw this album but once in my life, in a record store used bin some time in 1981-1983. After taking a look at the cover, I demurred. It just didn’t look like a record that would give me any pleasure. It wasn’t until Cherry Red’s Repressed sub label rose to the occasion, that I decided to put it on my want list. Having finally purchased it, I can state that it’s worth having for the curiosity factor alone. About half of it is a fascinating take on an alternate universe version of H17/Human League. Even the worst of it is better than several Human League albums that followed. This entry was posted in Record Review and tagged B.E.F., Geisha Boys + Temple Girls, Hot Gossip, Human League, Ian Craig Marsh, Martyn Ware. Bookmark the permalink. Fascinating and odd, Geisha Boys And Temple Girls is an album that has gotten better with age. I purchased it when it first came out because of the B.E.F. connection and a need at the time to have everything Ware and Marsh were involved with – such was the side of the line my feeling fell on after the split. At the time I bought it, I knew it was a curio, but I Don’t Depend On You and Geisha Boys and Temple Girls did keep my attention. You are right Monk, John Wilson outdoes himself where he appears on this album. Ware and Marsh should have offered IDDOY to one of the sugar coated soul bands of the time like Imagination. I can definitely hear Lee John singing it! Over the years it got little airing, but with the introduction of YouTube and my attempts to stump the service, I found it wasn’t that hard to find songs from the album and even videos. By 2008 I had it on CD – thank you Cherry Red – and some of the tracks make occasional appearances on playlists on my iPhone. I am a huge fan of this album,hearing he alternative versions of such favourite HL songs is a real treat for me,even if the vocalist is not our Phil. Like you Monk,I have only ever seen one or two copies for sale on vinyl(bought mine in a great second hand record shop in Amsterdam) and was thrilled to bits when the CD version finally came out. My favourite pieces are Morale and Houses in Motion.I have never heard the original Sting song,but I like Burn for You. I am still to purchase the 12″ single of their version of Metro’s Criminal World which RJ Burgess produced. 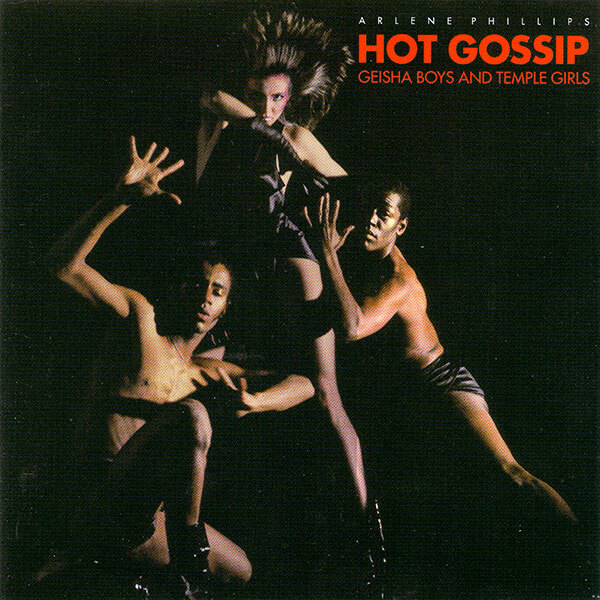 As someone who grew up watching Hot Gossip on tv every week,it was quite a revelation to me when I first heard this album.I wasn’t aware it existed until many years after release! Gavin – I recently bought the ” I Don’t Depend On You” 12″ and it’s a fabbo extended version with dub mix on B-side! My favorite record dealer now has the “Soul Warfare” 12″ for a pittance, but I can’t seem to save any of my discretionary stipend as there are many concerts to attend right now. Wish me luck in nabbing it before it sells. Like you, I also need the ” Criminal World” 12″ produced by Richard James Burgess. There was a Hot Gossip single – Break Me Into Little Pieces which came out around ’84 which was written by Ian “Hi-NRG” Levine that was massive in the NYC Gay Clubs and bars…I still remember the synth break – it was rather minimalist – and the bouncing synth drums and bass.